TORAYVINO™ is a home water purifier series that combines Toray’s developed hollow-fiber membrane and activated carbon technologies. These purifiers excel in eliminating residual chlorine, turbidity, rust, general bacteria and other micro-contamination. 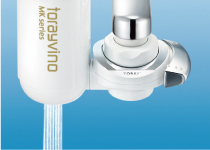 Toray products sold under this brand include systems designed to connect directly to a faucet, such as the TORAYVINO™ MK303, which meets all of the 12 JIS tests stipulated for household water purifiers, as well as stand-alone and under-the-sink models an pot models. Torayvino comes from a Japanese company called Toray Industries, Inc. Established in 1926, it has presence in over 20 countries (including USA, UK, China), with some 46,000 employees. It has a 66 percent market share among faucet-mounted filtration systems in Japan, which says a lot about how reliable and effective the product is. Torayvino produces 99.99% bacteria-free water through a 4-stage filtration system: The pre-screen removes impurities bigger than 465 um (micron) such as rust, sands, sediment, and particles; while the second screen removes impurities bigger than 114 um (micron), those that couldn’t be removed by prescreen. The granular activated carbon strongly removes residual chlorine, harmful chemicals, and bad odor; while the hollow fiber membrane precisely removes contaminants in the 0.1 um (micron) unit such as bacteria, rust, turbidity, coliform bacili, microorganisms, and microscopic impurities. A Torayvino faucet-mounded water filter could provide up to 1,500 liters of purified water. To put that in perspective, that’s about three to five months of regular use for a household with four individuals. After that, you need to change the cartridge only, not the whole unit. One important note about the replacement cartridge. In the market, there are many variants of replacement cartridge – 600 litres, 900 litres and 1,500 litres. This refers to the filtration capacity. For example, a replacement cartridge marked with 600L means it is capable of filtering up to 600 litres, beyond which it is due for replacement. The same goes for the rest of the variants. So be careful when purchase the replacement cartridge. The best is look for the marking on the replacement cartridge. By the way, Hi-Tech only carries 1,500L capacity replacement cartridge and it is the cheapest in terms of $ per lit. Removes all bacteria, harmful organic compounds and chlorine. 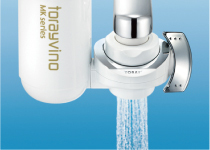 This MK303-EG filter, like all other Torayvino range of products, is a multi-filtration system that removes all bacteria, impurities and odors for clean, safe and tasty drinking water. It consists of Toray’s renowned hollow-fibre membrane, which contains more than 520 billion micro-pores for the efficient removal of 99.99% of all bacteria, and granular activated carbon which removes unpleasant chlorine, bad taste and odors. The filter also preserves all good minerals in the drinking water that are vital for human health. 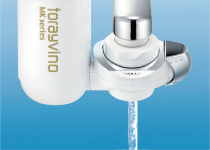 The Torayvino MK303-EG faucet water filter removes the dirt and odor from the water. Compact and easy to install, the water purification filter enhances your daily life by removing bacteria, harmful organic compounds and chlorine while keeping all the good minerals in your water with a double filtration system. It employs Toray’s proprietary 4-stage filtration technology. Toray’s best developed proprietary Four-stage filtration technology catches even the most microscopic contaminants. The Torayvino filter uses high-grade activated carbon to remove residual chlorine water odour and other chemicals from the unfiltered tap water. Ensures rust, sediments and impurities that are bigger than 114um (micron) that could not be removed by the first screen. the hollow fiber membrane precisely removes contaminants in the 0.1um unit such as bacteria, rust, turbidity, coliform bacili, microorganisms, and microscopic impurities.Toray’sadvanced multilayer hollow fiber membrane precisely removes contaminants in the 0.1um (micron) such as bacteria, rust, turbidity (clarity of water), coliform bacilli, microorganisms and microscopic impurities from water and other liquid solutions without removing calcium, magnesium and other minerals essential to the human body. The same membrane technology is used in dialyzer to purify blood in the medical field. Hi-flow with maximum rate of 2 liters per minute. MK303-EG comes with three optional modes of flow via a selector switch. The purpose of the selector switch is to allow user to select when to use filtered water and also when to use unfiltered water. This would help to prolong the filter filtration life span as we generally do not need filtered water during washing of dishes. Installation is very simple. It is a DIY type. In addition, the package comes with multi-adapters that fit most of the tap sizes in Singapore and also installation manual in english and other languages. Cartridge attachment / replacement is as easy as 1-2-3! Turn the water selection lever to “Unfiltered Straight” and insert the filter cartridge. Rotate the cartridge 90°to the vertical. This unique feature incorporated only in TORAYVINO® home filters! Simply open the filter cartridge top cap and check contaminant build ups through “See-through Window”to actually see whether the filter cartridge needs replacing. The filter water is therefore always safe and tasty. The filter cartridge comes with see-through window. Here you can monitor the cartridge life span. Simply remove the filter cap to check on the contaminants build-up inside the fibres through the See-through Window. When water flow is low, it is time to replace the cartridge. Multi-adapters for quick and easy DIY installation. This model comes with a 1,500 liters filtration capacity. Unit is completely Made in Japan. It filters off 99.99% of all bacteria and other impurities. Save space as it mounts directly onto the kitchen tap. For health conscious individuals, having a 99.99 percent bacteria-free purified water is of utmost importance. Thankfully, the Torayvino faucet-mounted water filter is here. Safe, convenient, cost-efficient, and aesthetically beautiful. More importantly, it works.